1400 start time on Sunday (Feb 29th) so try to arrive by 1330!! through a beautiful, older forest with great trails for running and hiking. This site was first used for a fun fall MASH Hash (#56) in October of 2002!! By Public Transportation: Take Line 1*** or Line 7 to Onsu Station (#145 on L1, #750 on L7)*** Note: If you're taking line 1, make sure you are on the train going to Incheon -- not Suwon!!. Leave Subway by Exit 5, 6 or 7. (See map for orientation) Look for some glass pyramids, as well as a parking sign. Walk to the parking sign. From there, just follow the chalk marks approx 200 meters to the hash site at the end of the parking area. 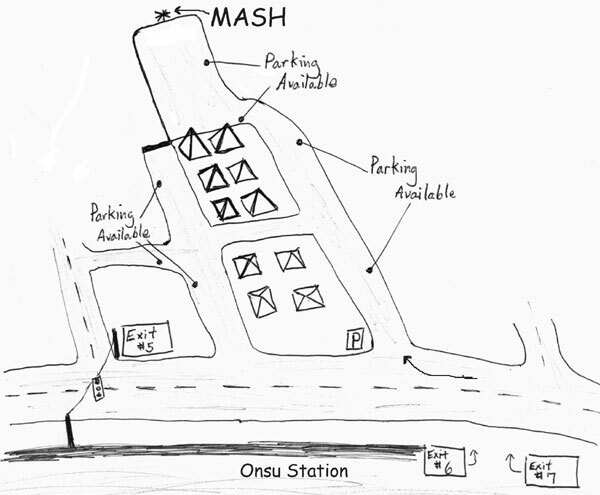 By Car: Locate Onsu Station and the area on a map. If you're driving from some place north of the Han River - locate the Mapo Bridge on a map, and drive to it. Zero our odometer at the first stop light after you cross the bridge. Continue straight and drive across Yeoido with Yeoido Park on your right. When you reach the south side of the Han River, go straight by taking the Gyeongin Expressway (shown on signs as "60"). Driving through the city, follow signs for Oryo IC. At 5.2 km, continue straight, but take the underpass and continue going straight. At approx 9 km, start looking for signs for Onsu Station. At 9.6 km, leave the expressway by turning right and going toward Onsu Station. Continue straight wth the train tracks on your left. Go just a few meters past Onsu Station (on your left). At 11.1 km, look for glass pyramids and a parking sign on your right. No, you're not at the rear entrance of the Louvre Museum - you're at the MASH 78 venue! Park where you like - parking is free here on Sundays! - make your way to the on-site at the upper end of the parking area (See map). If you're driving from some place south of the Han River - you could simply take the Olympic Expressway (direction Yeoido) and then get on the Gyeongin Expressway at Yeoido. Then follow the same directions given above. Try to be there by 1330! You can leave a bag and whatever food, etc in the cars while running or walking. Call 016-245-4072 if you get lost! There will be the usual snacks and drinks afterwards! Bring something for yourselves and bring something to share! There will be at least one grill! !